Why did you choose the name Sandman? I had many names but the Sandman can be related to many interpretations that I like in that name, from sand man (desert) to sandman (Metallica). How did you discover trance music? What made you decide to start making this music? 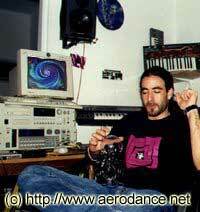 I don't really know what, but as I wrote, the first trance style came on the best moment at the best time, after people started looking for different vibes....mmm history. How do you feel about the new CD, Psycho Toons, now that it's out there? I'm happy that Psycho Toons got released in the year 2000 because it was a major plan for me to release a new album in 2000 (not that anything changed, or did it?? ), it is also refreshing for me, the music style offered in Psycho Toons. Someone whispered in my ear, that an interesting way to listen to this CD, is while playing on a Sony play station, what do you say about that? How does the new CD differs from what you have done till now? It's not that Psycho Toons is a dance album or a polka album, I made some tracks in the past with games' samples (Mario Brothers etc. ), I think that it's more mature and made with better sound and production, yes there is a definitely a difference on the production side. Give me an example for tracks you made with games' samples before? Star Finder (TIP, '97) was made with a lot of games' samples from generic "jump sound" to psychedelic Nintendo bombs. It was a weird combination of game soundtrack and a morning psytrance track. And by the way, this track was playing on channel 6 (the kids channel) as a soundtrack for an interactive phone game. Any special feeling you have towards Skinny Puppy? I believe I detected quite a few samples from the Puppies in your stuff. I think they had the best samples EVER, great minds! A project psytrance remixes CD of Skinny Puppy is on the way! I can't give more details about it yet, but I'll do the minute I can. Looking at the stuff you released over the years, it seems that you bounce around between different styles- metal head history, uplifting emotional Witchcraft with Rami in the beginning, dark gothic Witchcraft CD, a little clubby in Hommega, and now squeaky cyber world in Psycho Toons- are you a bit schizophrenic inside, or it's just different moods in different times? What was going on in your mind in each creation? Are you talking to me?? No, there is no other Itzik inside me, sorry. I'm young, you see, I want to explore as much styles as time will allow me. At the beginning I loved the emotional side of trance, it was so different from the metal world I was in before. But then came the exploring factor that started to develop in the early trance years and from that Sandman came along- industrial elements and metal sounds, it was IT! Especially in Europe. People just didn't believe someone from Israel can make night sounds and can teach them about psychedelic music- ha ha. 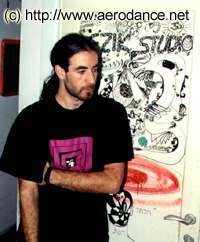 In 1999 the story was different (for me anyway), I just didn't want to make any more dark trance and from that Psycho Toons was born. With all these different styles, it still seems that you have your own unique place, and your music can't really be classified to a certain trance style, why do you think it's like that? How would you define your music? You released most of your stuff outside Israel, any reason for that? Not so sure about that... I have respect to some of the labels that released my material from the beginning, like Melodia (Eli & Israel), Hed-Artzi & Hommega. Of course without them I couldn't made my way outside Israel. Outside of Israel people have more open minds, you can hear it from the music that comes from there- and not just trance. It's very popular nowadays to collaborate with other artist, yet after the Witchcraft days were over, except for one track you did with Xerox, you work on your own, why is that? This is a good time and place to say that the track Psycho Toons was made with Xerox and because of a layout mistake it wasn't printed on the CD. Why? I guess my music is not the collaborated kind… who knows? Speaking about Witchcraft, my long ears heard rumors of you and Rami (Chakra) getting back to do some work together again, true or false? True, together with some other projects I plan on doing. What music do you listen to? Any recommendations? I like lo-fi music like Portishead, Massive Attack, Tricky, Bjork. Also I like movie soundtracks (Playstation and not). It all depends on my mood. Ammmm… not sure... I like Double Dragon, They are really good. Also the new Darksoho guys are Sababa (Hebrew slang for cool- Shahar). What are your future plans? Are you already working on new stuff? What direction does your music takes now? My million Dollars deal is on its way with a club trance project, which will be released this summer. Also a collaboration with Dudi Levy (an Israeli rock singer and guitar player- Shahar) for a cool album ... yada yada yada. I want to make normal music!! !